These 12 Powerful Questions were designed to help you as a baby boomer navigate the often turbulent transition from the working world into the type of retirement you are looking for. 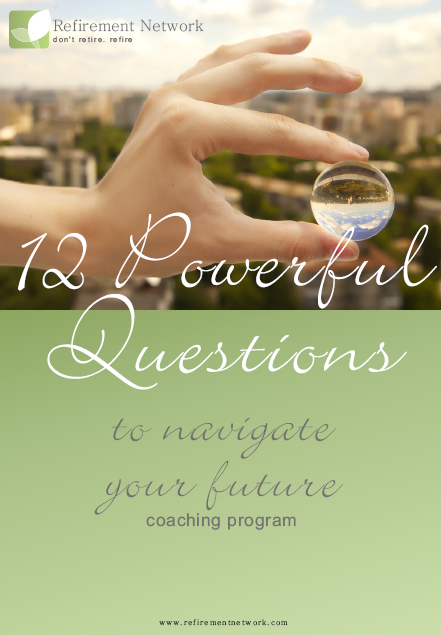 The questions aim to help you become as prepared as you can be, in all areas of life, for what lies ahead. They will help you start to visualise the type of retirement you want, and to open your eyes to what you could have, in the years ahead. The world of work has changed dramatically in the last 20-30 years since the time our parents started retiring, and is totally different from the world that existed in the late 1940s and early 1950s when the concept of retirement was first widely implemented. As people are living longer, healthier lives the thought of 3 decades of leisure during retirement is not that appealing, especially to the active, progressive Baby Boomer generation who will prepare to retire in the next 5-10 years. So what can you look forward to in your retirement? What does retirement look like to the Baby Boomer generation? 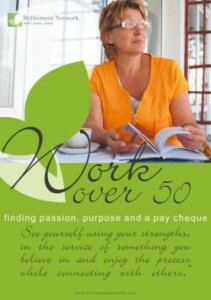 This book exists as a result of my many interactions with over 50’s who are looking to follow their passion and purpose but still earn a pay cheque in their next season of life. The book aims to help you understand how the world of work has changed since you entered it some 30 years ago and what this means for your next season of life. It will help you identify your attitudes about retirement and the choices and changes you need to make to enjoy the retirement that you desire. It will also help you identify your purpose and passions in life and help you build a talent profile including all your valuable skills and experiences that could be relevant to your next season of life. It will give you some practical tips and insights into employment options available and where to look for help in order to find the combination of work and play that suits you in your retirement years.